What’s in your EVE space? 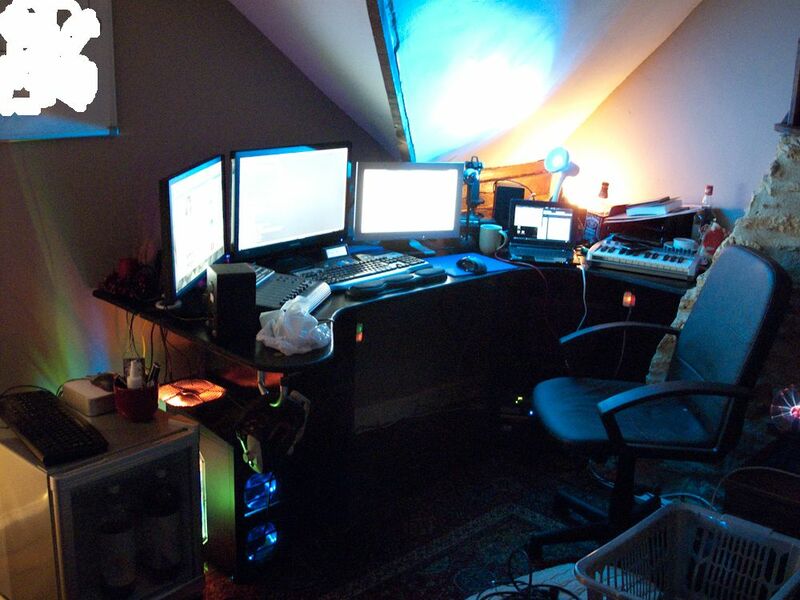 Well, the latest EVE blogger craze seems to be posting pics of your EVE workspace. And so here’s mine, albeit some months ago. The setup is fairly simple. There’s a 22″ monitor running on a Mac Mini for trading and work, the 24″ and 17″ widescreen displays are running on the desktop machine, which is a custom built box running Win7x64 (the only Windows machine in the room, out of 12 machines). That machine is based around an Asus mainboard with an E6600 2.4Ghz chip, a 275 series BFGtech OC2 graphics card, and 4GB of DDR2 RAM. There’s ~1.2TB of disk space across a bunch of disks in that machine, and another ~5TB distributed throughout the room. The storage is mostly full of backups and development snapshots of databases. The multimonitor setup is either used with an EVE client per monitor, or more often just the one EVE client on the main machine or the Mac depending on what I’m working on (Perl is on the Mac, Ruby is on the dev server via the desktop). The 17″ monitor is nearly always showing IRC (Xchat) and any Pidgin windows I have open for MSN/SILC/XMPP. All in all, it works out great. The desk above is my setup while I’m at university in term-time; back home in the holidays, this is how things usually look. Same setup, though you get a look at the desktop this time. The minifridge is vital to day-to-day operations, and it gets dragged along to uni. The netbook above isn’t really useful for EVE, being a netbook and all that, but it is handy as a little linux machine. Also in my EVE space are 4 fairly beefy network switches, various other bits of networking gear (particularly a Ubiquiti Networks Bullet M2HP running in bridge mode while I’m at uni to bridge my wired network in my room with the wireless LAN to the router downstairs), an APC Smart-UPS 1500VA rackmount for handling powercuts (though the router isn’t on battery backup, so this doesn’t permit uninterrupted EVE quite yet), and a grand total (at this exact moment) of 6 other server-class machines in 19″ pizzaboxes. These boxes get used for testing things, one is set up as a file server, one is set up as a development server (where I do all my work for EVE Metrics etc). Aside from computers, there’s always a comfortable chair, my trusty speakers and amplifier, and a large pile of books. Recently I’ve been keeping some weights in reach of my chair so I can do some reps while I wait for things to load or compute, which has been working well. As far as books of the moment go, I’ve just finished Terry Pratchett’s latest, Unseen Academicals, which is very much worth reading if you’re into Pratchett’s stuff. Secrets and Lies: Digital Security in a Networked World by Bruce Schneier is my new ‘current’ book, though Iain M. Banks’ stuff gets reread quite often these days. Posted on February 20, 2010 Categories Odds and EndsTags blogosphere, rambling, stuffisawesome2 Comments on What’s in your EVE space? This month’s banter comes to us from CrazyKinux himself, who asks the following: First there was the MMO on the PC, and now with the recent announcement of DUST 514, EVE will soon be moving onto consoles. But what about mobile? Allow your imagination to run wild for a second and describe how you would see EVE being ported to mobile devices, whether the iPhone/iPod touch, Blackberrys or Android-based devices. Dream the impossible for us! What do I mean, ‘no’? What I mean is, I would actively dislike it if CCP decided their next project was iEVE. Why? Well, it’s quite simple, really. It’s immersion. It’s partly why CCP won’t let people write UI addons in the style of WoW. EVE is very distinctive, and extremely immersive. It’s part of why it’s such a brilliant game. You just simply can’t replicate that immersion on a mobile platform, no matter the technology involved. I guess what I’m saying is that EVE shouldn’t be played on a mobile device. If we did get anything for mobile platforms, then obviously EVEmail and other information would be what you’d want. Some people would argue skill training should be accessible from outside the game. I’d have to disagree with that one, again on the grounds of immersion. You’re doing something very much tied to the game there, and it should remain in the game. Of course, the optimal way to do all this is just to open up some APIs and let people get to work on it. Look at the current offering of mobile apps- there’s loads out there and some (Capsuleer) are of an exceptionally high standard. Why should CCP try and replicate all this effort in-house when they could just open the appropriate APIs to developers? If CCP wanted to really fuel development of certain tools, they could take on the popular third-party devs for given platforms as contractors and task them with developing the features full-time, thus leveraging existing apps and talent while getting exactly what they want. It’d be good for the 3rd-party developer ecosystem and better for CCP, who get what they want at vastly reduced effort, cost and so on.